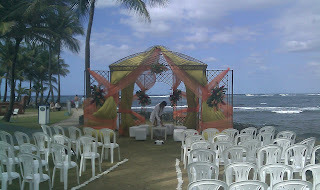 On Tuesday I got back from my long weekend trip to San Juan, Puerto Rico to see my friend Mo get married to his fiancée Jonnee. It was good to get away for a while and relax in the low humidity weather (the weather back at home was actually warmer - albeit sticky). I had a great time hanging out with some of my old Syracuse friends (we did end up watching the NCAA Championship in the hotel, but unfortunately Butler was playing instead of Syracuse). 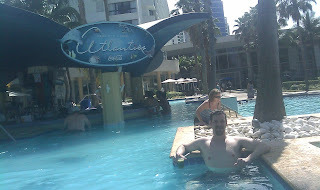 I became good friends with the hotel pool bar (see above) and Navin, Ruby and I took a trip to Old San Juan and to the Bacardi Factory (see below) on Monday. Those brewery/distillery type tours really do work in getting you all hyped up for the brand. All I wanted to do for the rest of the day was drink Mojitos and Cuba Libres. The night before I actually won money at a casino for the first time in a long time hitting a 40-1 payout on a three-card poker straight flush. Luck was on my side on this trip. The hotel we stayed at was great (the only hotel private beach on the island) but we did have a scare on Saturday morning when the power went out and smoke on our floor caused an evacuation at 7 in the morning. I just went and relaxed in a sea of hammocks and thankfully the power went back on an hour before the wedding. I'm sure the wedding planner was freaking out beyond belief. 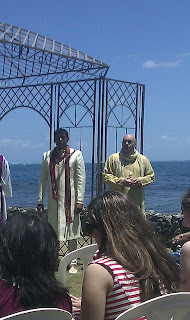 The ceremony was very nice and the weather was perfect. 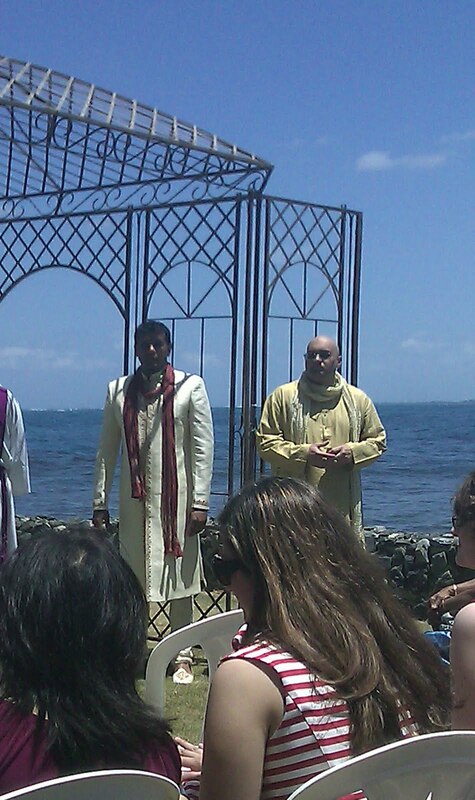 Pictures of the setting, my friend Mo (left) and Dharmesh (right as the best man) are shown below. The ceremony was a blast even if I was placed at a table away from the 5 people I knew that were there. I enjoyed some Bacardi Razz and Diet Coke concoctions and actually got in the middle of the dance floor in front of a bunch of Indians during "Jai Ho!" As good as the wedding was, I must say that Navin and Ruby's wedding from last year still sets the bar at a higher standard for Indian weddings. 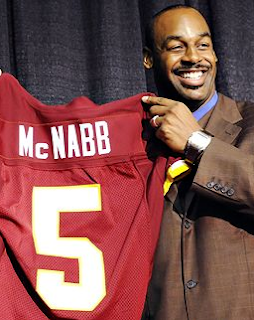 Sunday night I was checking my Twitter and Facebook at dinner and came across the breaking news that Donovan McNabb got dealt to my Redskins. This is huge news for me personally. McNabb has always been my favorite NFL quarterback as I went to school with him at Syracuse. He graduated two years after me and I still found myself rooting for him even though he played for the rival Eagles. Now I can fully legitimately root for him as he helms the Skins for the next 4-5 years (hopefully). He makes us an instant contender in the NFC East and I'm all of a sudden a bit giddy on the prospects for the team next season in the first year of the Shanahan regime. Back to reality though as I'm in work mode towards the end of the week. Josh's first tee-ball game (with the Rose brothers coaching) is tomorrow morning. Josh got a legit uniform with pants, a real MLB Orioles hat and an Orioles shirt. Expect a full recap sometime tomorrow or Sunday.